You can register online for a library card if you do not already have one from a public library. 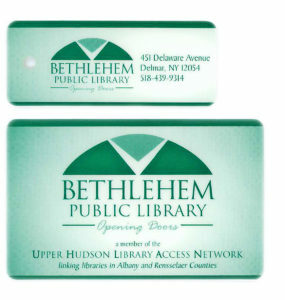 You will be able to access online materials and request items after registration, but you will have limited privileges until you pick up your card in person at Bethlehem Public Library. Online library cards will be usable for 14 days until you visit the Check Out Desk to receive a permanent card. After 14 days, the online library card will be deleted. You will need to show valid ID (current driver’s license or other picture ID) and proof of current address (such as utility bill or lease agreement) to pick up your card. You will need a valid email address to choose a Personal Identification Number (PIN) after you register. Please make sure the email address you enter is correct so you can get started using your library card as soon as possible. Call us at 518-439-9314 with any questions or if you need to update an existing card.